Born and raised in Japan, Junko is a singer-songwriter with passion for expression of emotion and communication through song. Her musical foundation is a classical piano, but her original music she had started to write about a little over 2 years is an eclectic mix of blues, folk, jazz, R&B, and Rock. She writes from her personal experiences and she often thinks her songs are almost like utterance. 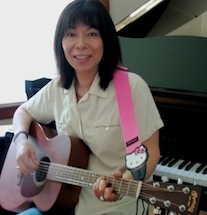 She sings in English and Japanese on piano, guitar and electric bass. In the misty dawn of 2009, an ancient race of singers, known only as Hengemen, came together to perform oddly likable songs and clever harmonies. With flowing beards that indicated rare encounters with sharp objects, these primordial warblers left their vocal legacy hewn into the rock-solid a cappella of Tonehenge. 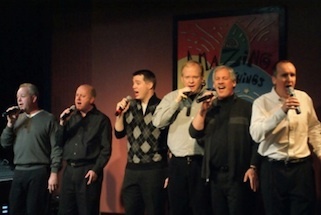 Now comprised of six mostly clean-shaven businessmen from the greater Boston area, Tonehenge performances have ranged from a soaring National Anthem to kick off a Lowell Spinners game to opening for Ball in the House. Please join us for what promises to be an evening of good home spun folk music with the hospitality to match. Tickets and refreshments will be available at 7 pm. General admission is $12. Students’ (with valid high school or college ID) admission is $8 and child’s admission is $4. Refreshments on sale include homemade pies, cakes and cookies, coffee, tea and soda.